In most of North America, winter is a very strenuous season for birds. The summer and fall vegetation has either been consumed or has withered away. In addition, most insects have died or have become dormant. Feeding birds makes their lives easier, and also gives us something to observe and enjoy. So, what types of bird food should you offer? It is best to provide a wide variety of food types. For example, you could offer black-oil sunflower seeds, cracked corn, white proso millet, seeds from squash and melons, suet blocks, and sliced fresh fruit. It is also important to provide unfrozen water. Don’t be afraid to make homemade treats! In Pennsylvania, the most common birds you will see at your winter bird feeder includes the dark-eyed junco, mourning dove, tufted titmouse, northern cardinal, blue jay, white-breasted nuthatch, downy woodpecker, and the black-capped chickadee. It is very important that you keep your visiting birds safe. 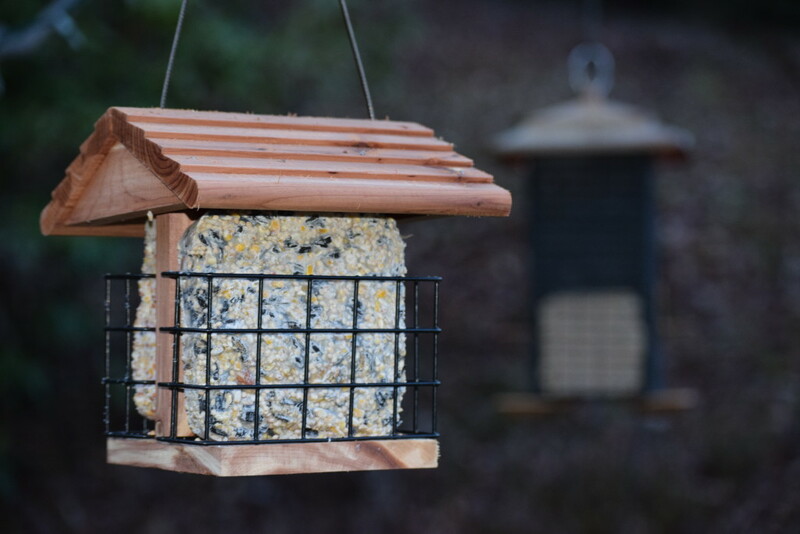 To do this, keep your feeders clean, place numerous feeders several feet apart to avoid overcrowding, and keep food dry and free of mold. Birdwatching is one of America’s favorite pastimes. Don’t forget to participate in the Christmas Bird Count and the Great Backyard Bird Count. 1. Melt shortening/lard and peanut butter in large pot on stovetop using medium heat; remove from heat when melted. 2. Measure all the flour, cornmeal, and dog food right into the pot. 3. Stir until everything is thoroughly blended. 4. Place mixture into your desired containers (could use plastic containers from previously boughten suet blocks). 5. Set your containers into the refrigerator, or in a cold place to set up.